The title of An American Marriage by Tayari Jones, her latest novel after Silver Sparrow (reviewed here), suggests a large, epic story with lessons about our country and the relationships it houses. But An American Marriage is also a surprisingly small, intimate story about a tragic love story and the people it affected. Roy and Celestial are an upscale African-American couple living in Atlanta who met at Morehouse and have been married about a year and a half. Celestial’s parents are wealthy, and she makes her living as an artist who creates artisan dolls. Roy works in sales, but has bigger ambitions. On a visit home to visit Roy’s parents in Louisiana, he is arrested after being falsely accused of committing a crime. He ends up in jail, sentenced to 12 years, while Celestial tries to rebuild her shattered world in Atlanta. She turns for comfort to her childhood friend Andre, the one who introduced her to Roy in college, leading to the third prong of the book’s central triangle. Much of An American Marriage is told through letters between Celestial and Roy, as the reality of their situation sets in and they try to remain connected even as their lives progress in cruelly opposite directions. The rest of the novel is told through alternating chapters narrated by Celestial, Roy and Andre, giving them equal time as they bare their souls, fears and hopes. Jones expertly paints each character sympathetically, blurring guilt lines and deepening the tragedy of the situation. The story will not end without heartbreak – for any of them – but the suspense of just how it will resolve makes the pages turn quickly. Jones is an assured storyteller and An American Marriage is hard to put down. Of course, the backdrop of An American Marriage is the pervasive racism of the justice system which landed these characters in their predicament. Class and money are not enough to save Roy from the fate of so many black men: incarcerated, his ambition and promise cut off at the knees by an indifferent judge and a society that doesn’t care. The book may appear quiet, even resigned, on this topic, but it’s there, the whole time – the institutional forces working against Roy and Celestial and the many other couples reunited briefly for visiting day at the prison. There are a lot of themes at work in An American Marriage – loyalty, parenthood (there are all types of parent-child relationships here) and what we owe the ones we love. In Jones’ deft hands, these themes work beautifully in this very personal, almost quotidian story with a bigger message about the blatant inequity in our society. Posted on March 31, 2018 by gayle. 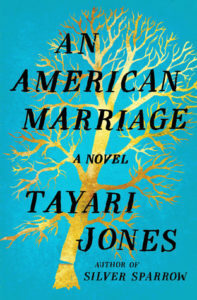 This entry was posted in Fiction and tagged an american marriage, tayari jones. Bookmark the permalink. This was a great book club read – lots of things to discuss. Surprisingly, the Oprah Book Club site had wonderful discussion questions, including the significance of the title, which I hadn’t even thought about until then. What makes the marriage in the book an “American” one? I just finished the book this morning, so the timing of your review was perfect. I think you hit the nail on the head with your review. Karen’s question about what is an American marriage is also on point and leads to much thought. Hello! I am a Korean student who first visited your blog last week. It was good to read the reviews of the various books on your blog. When I read your review, I felt like reading a book. So I would like to read one of the books you reviewed. If you have a book you recommend most, which book do you recommend? Try any books by Jennifer Haigh or Curtis Sittenfeld!